When St. Brendan's Church was built in 1979, its function was to serve as a "Mission Church" for St. Cecilia's Parish. 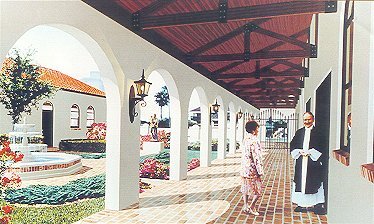 The new church was to provide easier access to Mass and the Sacraments for people on the nearby barrier islands. Because it was not intended as a parish in itself, no provision was made for administrative offices or educational facilities, and only minimal space was created for social activities. As St. Brendan's grew over the ensuing years, it developed into a full scale parish; however, because of its physical limitations, we have been unable to provide some services to our parishioners. To remedy these problems, after much consideration and discussion, the Parish Council and the pastor formed a Committee on Expansion to analyze the situation and to determine if further development was possible. The committee met regularly over two years and concluded that we should embark immediately on a Memorial Fund Campaign, called "Building Together in Faith." n November of 1997 a beautiful new addition to our parish was completed. The new facilities consist of two wings and a courtyard added to the southern boundary of the original church structure. Improvements include a social hall with kitchen, educational classrooms, choir practice facilities, administrative offices and an engineering maintenance work area. The new building is completely integrated with the church incorporating the use of arches, bricks and a Spanish style roof tile. Thus, a Spanish motif is incorporated throughout the entire building complex. These expanded capabilities allow us to increase the number and quality of our social and faith formation opportunities. The new hall provides us with the capability to host social functions such as the "Getting To Know You" party and the St. Patrick's Dinner Dance. Our Women's Guild uses the hall for its many and varied functions including lunches, fund raisers, membership teas and social gatherings. The Navigator's Men's Club hosts pancake breakfasts, chili dinners and a lecture series in addition to its communion Masses. The new facilities provide increased opportunities for coming together after important events in our lives take place, such as funerals, weddings and baptisms. Thus, we can come together in times of sorrow and joy and we can come together as a family.